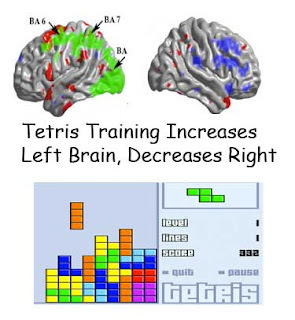 Interesting article about how researchers attempting to train teenage girls in a visualspatial task (Tetris) did see increases in cortical thickness in visualspatial areas, but how they were also surprised to see reduce cortical thickness in the opposite hemisphere (not in visualspatial areas), but in the right prefrontal cortex. So the stronger certain areas of the left brain became, weaker connectivity on the right. Be careful of what you wish for. The neurological literature is filled with anecdotal reports about how injury in one hemisphere of the brain could compensated for by higher activity in the other, but the mechanisms of how different sides of the brain create a balancing act are virtually unknown. The right and left hemispheres have some overlapping functions, some complementary functions, and some functions that seem designed for cooperation. Some of this up in one hemisphere, down in the other is not completely unanticipated by us, perhaps because of the frequency of twice-exceptional kids and adults that we see and know throughout history. Individuals who may be phenomenally talented in or gifted in one area, may be phenomenally inept or backward in the other. A common profile we see among the spatially-talented is delayed language development and poor expression through words. Conversely, it is not difficult to find phenomenally verbal individuals who are quite backward in basic spatial orientation and problem solving. A finding such as this raises questions about whether 'intense brain training' will do what devotees hope it will...increase capacities in all areas. The likehood is that it won't. It'll be interesting to see what future studies find. Balance is the key point to how you can train your brain to achieve success.